Since pergolas are often installed over back patios, they expand the living space. This is one of the most common reasons why people invest in such outdoor structures. If you think about it, most houses have a small or big backyard. But how much do they enjoy it? In order to spend time outdoors, you need to create the right conditions. Building pergolas right outside your living room will give you the opportunity to keep the sliding doors open and use a large space for any family activity. With wood pergolas making more livable space, you find more and more reasons for staying home more. Or invite friends over. Or have the kids close by but not under your nose. You can use the available space for all sorts of activities without even messing the place indoors. And although this is mainly the ideal space for the warm days, you can always take advantage of some nice winter days to enjoy your garden in a sheltered environment. This brings us to another major reason for installing a pergola. Pergolas provide shelter. Even if you don’t have enough space for a big pergola, part of your garden will be covered and thus protected from the weather and elements. This advantage serves many purposes. First of all, you will not be affected by the rain, wind or sun when you sit outside. On top of that, your outdoor decking will be protected from elements too. When it’s windy, flying objects won’t come near your windows threatening to break them. And when it’s raining, the windows won’t get dirty. Not to mention the great protection pergolas offer to the garden furniture. You won’t even have to find storage room for them to protect them during the winter. You can just leave them there. Last but not least, wooden pergolas make a great home upgrade. 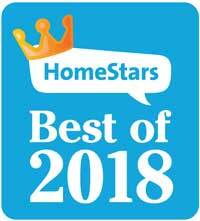 They increase the home’s value especially if they are combined with custom decks. Don’t forget that there is not only one pergola design or style. 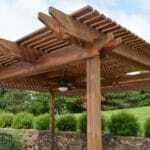 Distinguished by their beamed roof, wooden pergolas can be custom made in any size and shape. They can be big or small and painted any color you like. You can throw long drapes over them or use them to protect flowers. 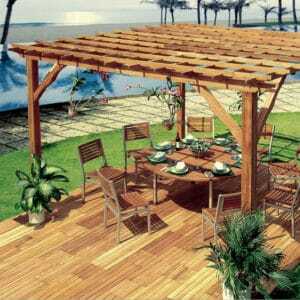 Then again, you are wondering why order a wood pergola and not just get ready-to-assemble pergola kits. Well, wood is a natural material and thus will blend beautifully in the landscape. It can be painted or stained. You have many wood options. And it’s a strong material. On top of that, you can have them custom made the way you like them. Don’t forget that dreamy gardens need good planning and stable structures. 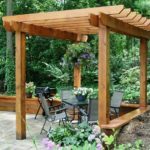 You need experienced pergola contractors and builders to help you out with such projects, which are meant to expand outdoor living and make an ordinary environment the place where you relax and enjoy your home.